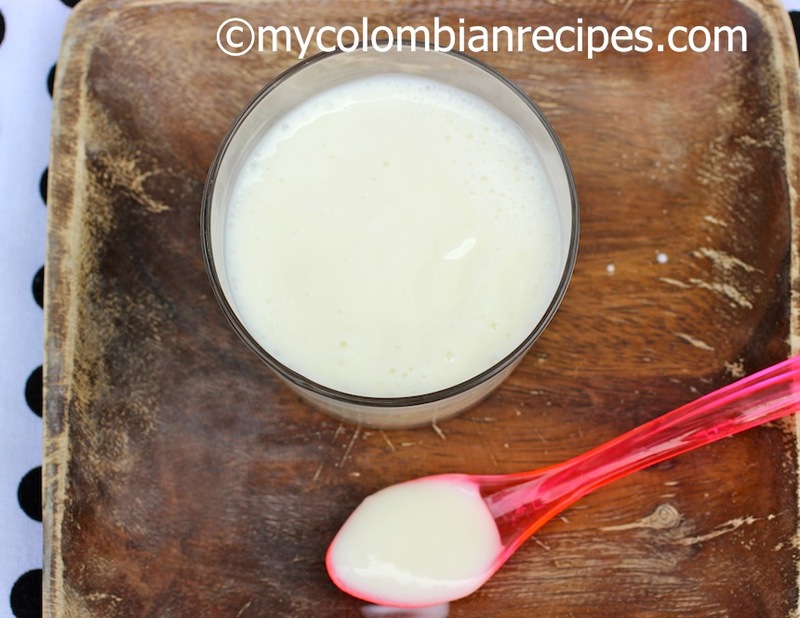 Kumis is a sour and creamy, popular Colombian drink. You can find it pre-made in almost every grocery store in Colombia, so making Kumis at home is no longer so common. The traditional way to make Colombian Kumis is by fermenting raw unpasteurized cow’s milk over the course of several hours or days. My grandmother made Kumis from scratch all the time. She had a large clay pot just to make Colombian Kumis. I actually hated it as a kid. I only started drinking it when I came to the United States and began missing my Colombian food. Making Kumis at home is very easy and I want to share two different, but both very easy recipes for making Kumis. You don’t need special ingredients or fancy equipment to make these two recipes. 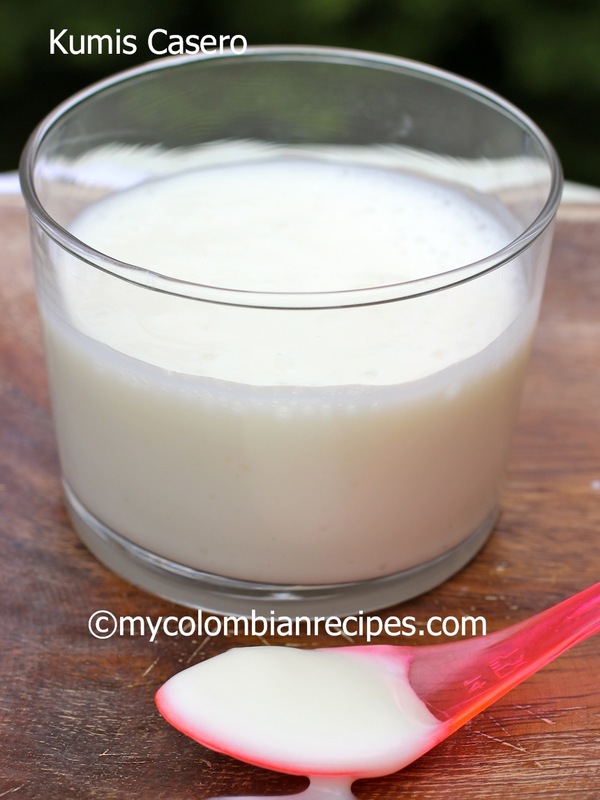 Here are my mom’s and my Aunt Luz’s Kumis recipes using pasteurized whole milk. Buen provecho! Put whole milk and lime juice in glass jar. Place the mixture in a glass jar and cover with a clean kitchen towel and set aside at room temperature. Let the mixture sit for 12 to 24, hours stirring periodically with a wooden spoon (not metal). Heat the Milk in a saucepan over low-medium heat. Don’t let it boil. Let the milk cool until hot to the touch. 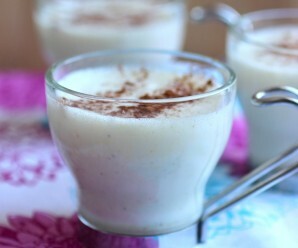 Pour about a cup of the warm milk into a small bowl and whisk it with the yogurt. Pour it back into the pan of milk. Place the mixture in a glass jar and cover with a clean kitchen towel and set aside at room temperature. Let the mixture sit for 12 to 24 hours. Place the mixture in a blender with the sugar and blend until smooth. Place in the fridge for 24 hours more and serve. Huh…you got me intrigued! Want to try this! Sour and creamy…sounds fantastic and lovely for the summer. seems sort of like kefir. My girls LOVE that! I wonder if they’d like kumis. Do you ever flavor with fruit or fruit purees? I don’t! I like to drink it plain! I think you know how much I enjoy dairy/cheese products 🙂 Must give this a try! this is really, really interesting, erica! my first thought is that i wouldn’t like the taste or texture of this, but after mulling it over, i think i simply must give it a try! 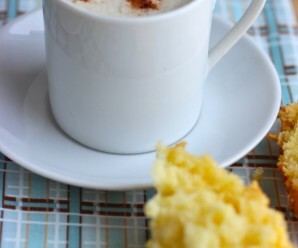 When growing up in Venezuela my Dad would make this…Wow it’s been so long since I had this…..
Hi Norma, would u share your dad’s recipe if have it? Question: the second recipe wouldn’t make yogurt instead of kumis since you used yogurt to star with? 1. 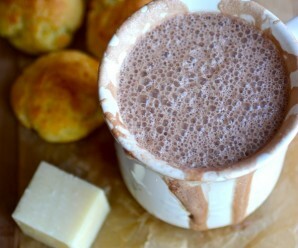 Have you tried either of these recipes with raw unpasteurized milk? 2. In your aunt’s recipe “Let the milk cool until hot to the touch. ” don’t you mean ” warm to the touch” ? Typically temperatures over 120°F will kill the starter bacteria. 3. Can reculture a new batch of kumis using some from the previous batch or is it best to start fresh with starer from yogurt ! I have made Kumis at home that is very thick and great tasting, using a small 150ml pak of store bought Kumis as a starter, and a 1.1 Liter bag of Whole Pasteurized Milk. Both are at room temperature when I start. Into a sterile plastic jug of about 1.5 Liters I empty the small Kumis pak. Then I pour about half of the whole milk into a sterile, plastic measuring cup and place it in a small microwave oven. I use full power for 90 seconds and the milk is warm, not hot, about 85-90 degrees F. I pour the warmed milk into the jug with the starter Kumis and stir for a few seconds with a sterile spoon. I then pour the rest of the whole milk into the empty measuring cup and microwave it for 90 seconds. I then add the rest of the warmed milk to the jug and stir to mix it all up. I cover the jug and place it in warm cabinet that is about 95-100 degrees F. It is warmed by a 40 watt bulb. After about 3-4 hours it thickens and I place it overnight in the fridge and the next morning I enjoy a cup of fresh Kumis. As long as I leave about an inch of Kumis at the bottom of the jug, I can repeat making more Kumis from only Whole Milk. Since I arrived in Colombia 2 years ago and a carpenter made my warmer cabinet, I have bought the small 150 ml starter pak only three times. 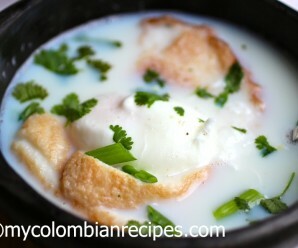 Colombian Kumis is a cheap imitation of the Mongoliank Kumis (also spelled koumiss and koumis). It is essentially a cultured milk drink just like kefir, but instead of using cow or goat milk, Kumis is made with mare (horse) milk. The real stuff is a probiotic drink with substantial health benefits. 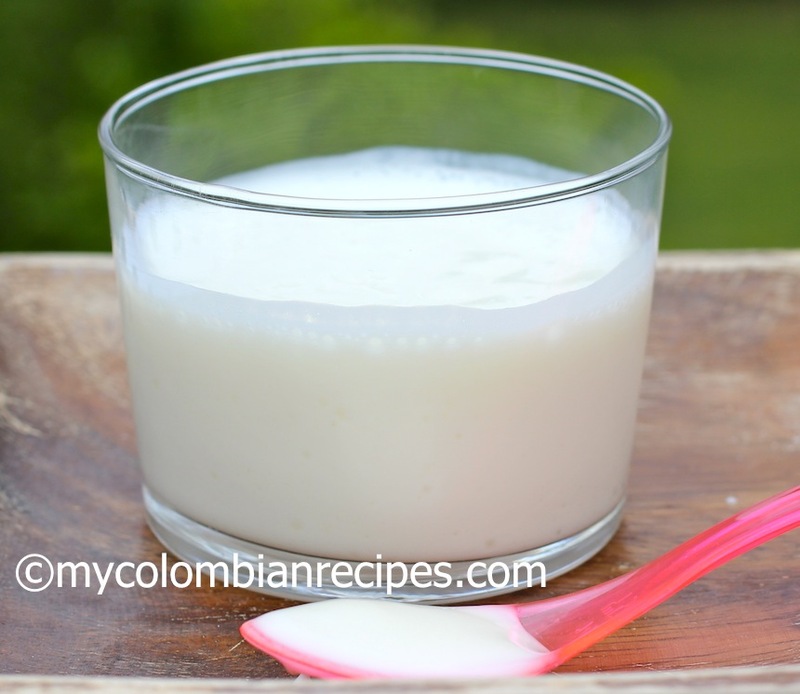 The Colombian Kumis is made with plain low quality cow milk. while tasting ok, it is basically curds (made by adding lime juice o milk), with added sugar (why? ), then heated to kill most beneficial cultures of yeast and bacteria that kefir and Kumis are known for. You cannot buy or make your own real Kumis but most stores in USA carry real kefir. There is no reason to be insulting. First of all many cultures have a version of kumis. That goes back many years and the variations on recipes are also depending on what was available , cow milk, goat milk, horse milk etc. If you don’t like it, don’t make it or drink it and leave no comment. Everything else is unnecessary . I know this is long after the original post, but I have to agree with at least one commentator who said this is just yogurt, and it sure is. I make yogurt all the time, kefir too, and those directions for the second method are the same as for making yogurt. Then you add all that sugar. The first method it is the way I learned on how to make a substitute for buttermilk. Our people from Central Asia and Siberia made Kumis – Qimiz from Mare-Horse milk. It is fermented milk with mild alcohol. Also from Camel milk we make Qimran. Almost same process. Kumis is not Colombian. we do consume it here a lot but it is not Colombia. I hate that Colombian claim they invented so many foods such Arepas, Empanadas, Arequipe (Dulce de leche), Tamales, Morcilla (blood sausage or blood burst), and so on. You’ll always find all those things all over Latin America and Brazil, and in cases like kumis, Asia. This is central asian origin…. the word is turkic – credit where its due. This is the food of my ancestors for 1000s of years (Scythian, Bashkir, Kazah, etc) not South America… this has been brought to the country possibly by Russians within the past 200 years.